This article, written by a divorce lawyer who has represented both business owners and the spouses of business owners and a business lawyer who advises business owners regarding their business and estate planning, is a guide to ethically navigating a divorce. Of course, there are plenty of illegal and unethical ways to do so, as well. Please stop reading right now if that is your goal. Our purpose is to assist the business owner who wants to do “the right thing” without being eaten for lunch – and the spouse who benefits thereby. In today’s commercial environment, keeping business information confidential is an absolute necessity in most cases. Types of information that must be kept confidential include the items discussed below. Salaries of Key Employees: If you are a competitor and you want to lure a key employee, you would know where to start. Cash Reserves: This type of information can be very valuable to competitors in the event they want to start a price war and lure away customers. Acquisition Targets: Knowledge of this information could lead a competitor to try to either buy the target itself or raise the costs for doing so. Value of Intellectual Property: This information can serve as an indicator of the company’s strengths or weaknesses. As soon as a divorce is filed, the lawyer representing the business owner should seek a protective order. A protective order, while not perfect, can provide a degree of protection and also remind everyone involved in the divorce as to the necessity of not revealing confidential information. The protective order should include the following: 1) which information is considered confidential; 2) who will have access to this information; 3) a statement that all persons having access to the confidential information will sign an acknowledgement that they are bound by the order; and 4) what will happen to the documentation after the divorce is finalized. After valuation of a business during the divorce process, the business-owning spouse almost always says, “The appraisal was too high.” A lot of arguing can be avoided if the business owner and his or her divorce attorney consider taking certain actions before the appraisal is conducted (and preferably, before the divorce action is filed). Obtain a Legal Document that Accurately Reflects the Value of the Business. If a legal document that sets the business’s value already exists, make sure it is accurate and appropriate. For example, an existing buy-sell agreement written to aid in disposition of the business in the event of the owner’s death might date from many years earlier, be backed up by life insurance, and contain an inflated value. The signatories of the buy-sell agreement do not care because the agreement is going to be funded by insurance. The lawyer of the non-business-owner spouse might argue that the number in the agreement should be used because it was agreed on at arm’s length. Judges often like that because it settles the issue without a great deal of work. However, use of an agreement with an inflated value will be to the detriment of the business-owner spouse. Business owners often present rosy financial statements for the purpose of getting a loan, selling the business, determining bonuses, or another reason. Sometimes the financial statements are inaccurate because the business owner or employees have paid insufficient attention to them. Sometimes there are problems such as bad debt that should have been written off or obsolete equipment (or even equipment that does not even exist) that is still carried on the balance sheet. The business-owner spouse should attempt to rectify inaccuracies in the statements before the business is appraised. Businesses often defer necessary expenses, which then are not shown on the books (this became far more common during the recession). The business owner might keep a list of such expenses and try to avoid them as long as possible before actually incurring them. When the appraisal comes in, the business-owner spouse is irate because these expenses were not taken into account. The business owner may be better off actually incurring certain expenses before a divorce rather than arguing with an appraiser later that these expenses are necessary and should have been taken into account during the appraisal. In today’s fast-moving, high-tech world, business owners often need to hire key employees either in the technological area or in the management area. Such employees might not have an immediate return on investment, but are often vital to long-term business performance. Sometimes these key employees are paid more than they are immediately worth, with the hope that their value will be realized in the long run. In such cases, it is better to hire them before the appraisal – and even better, before the divorce action has even been filed. Especially during a recession, employees sometimes work to the breaking point, but continuing to put in excessive hours is unsustainable. An example would be a company’s engineering staff that has been putting in 70 to 80 hours per week during the recession because the business owner cannot afford to hire any new employees. Business owners often argue with the appraiser that they need more employees, but appraisers are skeptical, thinking that if more employees had been needed, the business owner would have hired them. Many businesses, as varied as hair salons and software development companies, may lose value when a key employee is getting ready to retire and is not easily replaceable. This retirement can cause a decrease in the value of the business. The business owner should attempt to anticipate such employee events and take appropriate steps to achieve optimal timing. Many businesses have deferred-compensation plans, the funding of which will substantially reduce the value of the business. These unfunded liabilities are often not reflected on the books of the business because the business owner has forgotten about them, the business is on a cash basis, or putting the liabilities on the books might violate a loan covenant. Other times, the plan may be an underfunded defined-benefit plan. The business owner should, if possible, fund the plan before the divorce action is filed. Often a business may have a qualified plan, whether a simple retirement plan or a hybrid-money-purchase plan, that is underfunded. Although putting money in a 401k plan would typically result in half that money going to the non-business-owning spouse, consistently putting that money into the plan reduces both the income of the owner and the value of the business. Ensure Environmental Concerns are on Record. If the business owns real estate and has some sort of manufacturing process, there is a good chance that before the property or the business can be sold, there must be an investigation to determine if there are any environmental liabilities. These environmental liabilities might not have arisen from the present business, but the state Department of Natural Resources or some other agency may require that they be fixed before sale. And buyers always want to check for environmental problems before sale. Some problems can reduce the value of the business, even if the buyers do not insist on the seller fixing them. In the new regulatory climate, most financial institutions, if not all, will require some sort of environmental testing. You do not even have to own the property for an environmental problem to be key – there may be provisions in the lease or elsewhere. Any environmental problems related to the business or real estate may greatly reduce the value of the business and thus should be on record before the divorce action commences. One way to prove that a business has less value, especially if the owner is considering selling it anyway, is putting the business on the market and having it sit unsold. This can be living proof that the business is not as valuable as the non-business-owner spouse or his or her experts may believe. The common belief is that most business owners preparing for divorce are very good at taking steps to hide the value of the business. While this does happen on occasion, more often the reverse is true. Most business owners, in our experience, are honest and are not trying to cheat their spouse. The situation is more complicated if a business has been taking in substantial amounts of undeclared cash. No matter which side you represent – the business-owning spouse or the non-business-owning spouse – this undeclared income is a time bomb waiting to go off. A lawyer who becomes aware of such a situation should try to persuade the business-owning spouse to put all these payments on the books for multiple reasons, not the least being so that the business owner is in compliance with tax laws. A business owner can feel bad enough having to pay his or her spouse once, but paying twice for the same item is salt in the wound. Although so-called double counting is impermissible in most states, identifying and preventing it are not easy. Double counting can take several forms. Most commonly, it occurs when the value of a business is entirely or mostly embodied in the personal goodwill of the owner. A typical example is when the business is a professional enterprise, such as a law or medical practice. In such cases, the value of the business disappears if the owner is not included in the sale, which is usually reflected in the insistence of a buyer that the seller sign a non-competition agreement. If the business-owning spouse is required to pay maintenance to the other spouse (which is common), the maintenance will be paid from the business owner’s income, which is the same as the business’s income. Thus, if the business’s value is based on the business owner’s value, which is recognizable by his income, and the business owner also must pay maintenance arising from his services, the value and the income are actually the same thing. In most states, the answer to the dilemma of double counting is whether the goodwill is capable of being sold. If so, it is generally divisible as a marital asset. In other jurisdictions, however, there is a distinction between professional and corporate goodwill, with the former not being divisible. Still other jurisdictions do not differentiate at all. Moreover, McReath nowhere defines “attendant to the business interest.” This issue is of particular concern for professional businesses because aside from the hard assets and accounts receiveable, there typically is nothing to sell other than the professional’s personal services. Unfortunately, McReath does not assist in clearing the “quagmire” noted by the court of appeals; the supreme court did not specifically address the “unfairness” of double counting assets. In sum, each business should be assessed on its own merits. In fact, in many situations, it is wise to assess each individual component of the business to ascertain whether it is being considered both for income and property purposes. Loan Renewal. The renewal of a loan may require additional collateral or a significantly higher interest rate (sometimes as a result of the divorce itself). These variables can substantially affect the value of a business. Working with the Attorneys. Coordination and communication between the business’s attorney and the spouses’ divorce attorneys are crucial. The business attorney possesses important information regarding the operation of the business and the downsides and risks of the business operation, which play a large role in its valuation. The divorce lawyer knows how that information will play out in the family-law arena. The attorneys must coordinate providing information and working with the appraiser. The first step is to determine whether an appraisal is even necessary. Avoiding an appraisal can save substantial resources and risks. Second, if there is to be an appraisal, the choice of appraiser is crucial. In addition to helping select an appraiser with competence and integrity, a family law attorney might know which appraisers are likely to impress a family court judge. Third, the interplay between property division and support is often important. Sometimes this issue arises in the area of goodwill and double counting, as discussed above. Other times, it arises in the realm of normalizing income for purposes of establishing the actual income of the business. Next, as discussed above, the risks of unreported income and other potential tax issues must be considered. Numerous other areas of concern requiring coordination might also arise. In each instance, the divorce attorney and the business’s attorney must communicate and cooperate to bring their individual knowledge and experience into play so as to derive a satisfactory result for the client. Business-owner spouses face substantial risks in divorce. These risks include overvaluing the business and double counting the asset value and the income available for support. In dealing with these risks, business-owner spouses should work with both their business attorneys and their divorce lawyers to achieve the best results and ensure that the resultant valuations and support orders are accurate and in the business owners’ best interests. This article was co-authored with Sandy Swartzberg, U.W. 1977, a business law attorney with Weiss, Berzowski, Brady LLP, Milwaukee. 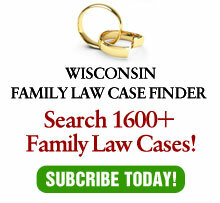 It originally appeared in Wisconsin Lawyer Magazine. 1 – McReath v. McReath, 2010 WI App 101, ¶ 2, 329 Wis. 2d 155, 789 N.W.2d 89, aff’d, 2011 WI 66, 335 Wis. 2d 643, 800 N.W.2d 399. 2 – Sommerfield v. Sommerfield, 154 Wis. 2d 840, 454 N.W.2d 55 (Ct. App. 1990). 3 – Peerenboom v. Peerenboom, 147 Wis. 2d 547, 433 N.W.2d 282 (Ct. App. 1988). 4 – Maley v. Maley, 186 Wis. 2d 125, 519 N.W.2d 717 (Ct. App. 1994).